From the Eisner Award-winning creators of Powers comes this all-new, all-ages superhero adventure for a new generation. Taki and Olivia are sisters with superpowers. In fact, they are the only ones in the world with superpowers...so obviously, they have to become superheroes! But is the world ready for real-life superheroes? Are the girls ready for the challenge? And will the accident that made them who they are reveal secrets that will change their lives forever? The answers are no, no and yes. This is a brand-new all-ages adventure. 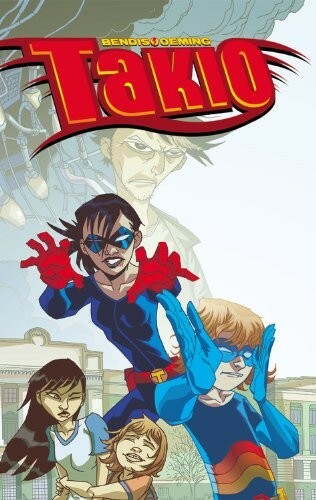 A new book for comic-book fans of all ages, Takio is on the 2012 YALSA Great Graphic Novels for Teens List. When you're older, having a sibling can be a great thing, giving you somebody close to you to talk to who has experienced many of the same things you've gone through. When you're a kid, though, it can be a different story. Your sibling is always there. They can be demanding and downright mean. So it's not surprising that kid siblings often have difficult relationships. But imagine if you had a sister who really got on your nerves, but the two of you had to save the world together?